The Town of Odyssey • View topic - The Town of Odyssey Turns Thirteen! The Town of Odyssey Turns Thirteen! Post subject: The Town of Odyssey Turns Thirteen! I am pleased to announce that the ToO has officially turned thirteen! Yep, we're officially in those challenging teen years that parents dread. Don't make me take your phone away and make you do your homework, ToO! It has been thirteen years since Shadowpaw started this amazing board! Every year it gets more unbelievable that the ToO has been around for so many years and still has a number of original members, and is still gaining new members, not to mention all the people in between! You guys are all awesome! Dan has provided a timely anniversary surprise this year. 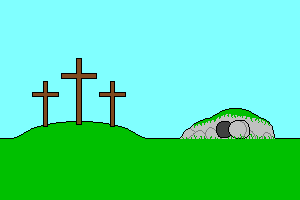 Instead of his usual birthday image, he's provided something perfect to remind us why today is really special - not the ToO's anniversary, but Easter Sunday, a day to remember that Jesus is risen! Post subject: Re: The Town of Odyssey Turns Thirteen! Happy birthday ToO!!! It's been an honor lurking here for the last four years or so. Happy birthday ToO! Hard to believe that it's been almost 12 years since my sister convinced me to join! Happy Birthday, ToO!!! This place has meant a lot to me over the years. I'm still shocked at the fact that the ToO is about as old as me. Even though I'm a bit late, Happy Birthday, ToO! Thanks a lot, Rosie. Now I feel really, really ancient, not just kinda old. HAPPY BELATED BIRTHDAY TOO!!!!!!!! *dances around* Woot!